kids to school, you want reassurance that your house and valuables are locked up safe. That’s where we step in. 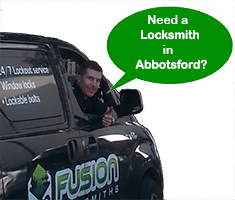 As your trusted Abbotsford locksmith, we have your security as our number one concern. Our experienced team at Fusion Locksmiths assess your home security and check your locks to ensure everything is in top working order. All our locksmiths are fully licensed, trained and members of the Master Locksmiths Association of Australasia. By following strict locksmith industry standards you can rest assured you are getting the best. As locals to Abbotsford, we give you the best service as you deserve it. From your very first phone call to us we explain how we can solve your lock or security problems by offering different options. With no obligation you are free to choose the best option for you based on your requirements. We also offer a huge range of locks that match any size budget and security issue. We are ready to help! Our fast and reliable 24 hour, 7 days a week, lock out service gets you back inside your home before you know it. We keep your family safe night and day, all year round.